Our proprietary Astor Economic Index® is still showing good growth in the US economy. The index rebounded somewhat from last month as jobs growth continued strong and the purchasing managers surveys became more optimistic. The shutdown did not affect the market moving measure of private payrolls with the rate of job creation increasing solidly compared to a year ago. Less optimistically, we are seeing some weakness in consumer confidence. Finally, the Fed announced a pause in its tightening plans last month. We normally would have received the advanced reading on fourth quarter GDP by now, but the government shutdown has skewed the schedule. Various of the regional Federal Reserve banks produce nowcasting estimates as an exercise in improving our real-time understanding of the economy. The New York Fed is currently nowcasting an estimate of 2.6% Q4 growth, with growth seeming to slow slightly in 2019 based on the limited data released to date. Similarly the Atlanta and St. Louis models are showing Q4 growth of about and 2.7% and 2.9% respectively. While job market gains are strong and the current output levels continue to be above potential, consumer confidence weakened in January, though it remains at high levels. 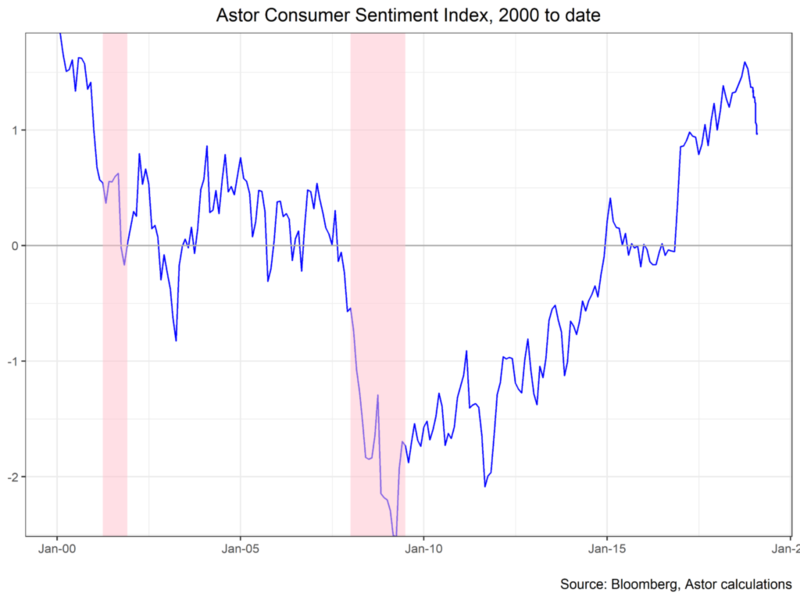 The chart below shows the Astor Consumer Sentiment Index, which abstracts a common core from several surveys of economic optimism. The timing of the drop makes me hopeful that it’s due to disappointment in a long partial government shutdown, something which is possible (if not easy) to quickly reverse. In their January meeting the Fed announced a move from a tightening bias to a neutral one. The rationale given was that tepid inflation and some real or potential economic headwinds gave the Fed room to await more data to assess. This is not the first time the Fed has paused in this tightening cycle – they took a year long pause after their first hike and also skipped a quarter in 2017. That is to say nothing about a pause in and of itself means that the tightening cycle is over. Specifically, what data caused the pause and what data may restart the tightening? The Fed cited lower growth in Europe and China. The FOMC is also concerned with the uncertain resolutions to US trade conflict with China and the potential for economic damage from an additional government shutdown. Overall, while I highlighted the chance for a pause in last month’s commentary it was not my main forecast and in the event the statement was more dovish than I anticipated. The usual interpretations of the Fed funds futures market sees the Fed on hold for a year or more. I will be paying extra attention to the Governor’s speeches this month to see if they think the market has gotten ahead of the Fed. I think the June meeting would be the first one with a chance for the Fed to resume hiking. The Fed also discussed how it is unwinding its Quantitative Easing swollen balance sheet. The main point was that the ultimate size of the balance sheet will be driven by banks demand for reserves rather than a move toward a preset dollar amount. This has been interpreted to mean that the end of the balance sheet reductions may come in the next twelve months, though it is clear that the FOMC has not made a decision yet. It was widely expected that the Fed would hold a higher balance sheet as a percent of GDP than before the crisis, but I think the balance sheet will be higher than I anticipated. 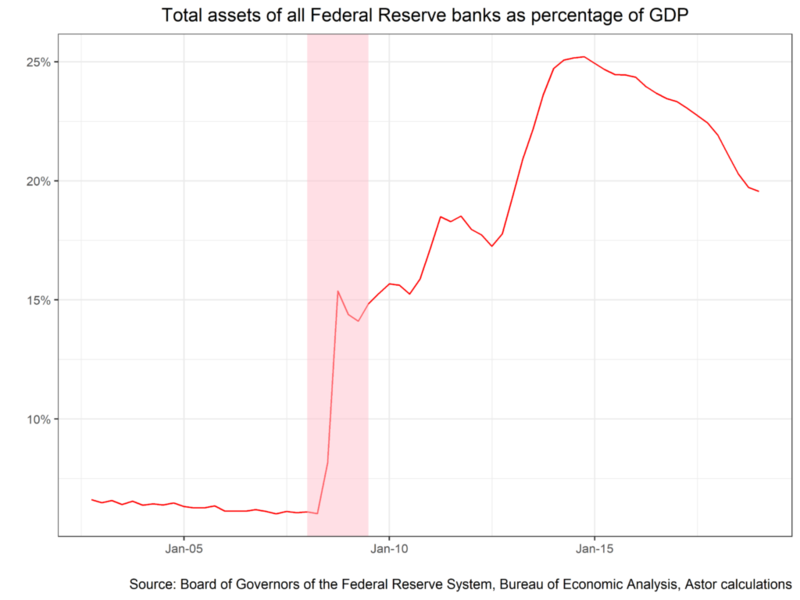 The chart below shows the Fed balance sheet as a percentage of GDP. The Fed also stated clearly what many thought was implicit: they will use the balance sheet to adjust the economy if they think their primary tool of short term interest rates is inadequate. I believe this is a reaction to the idea that because short term interest rates are only about 2.5%, the Fed can add only add modest support in the event of a recession. This is making clear that the Fed sees its balance sheet as a potential tool to promote growth with low inflation, though not the first they will use. For still more charts you can see our weekly collection of economic charts or download the Astor Economic Research App from the App Store. As always, we at Astor will be monitoring the economy closely to inform our investment decisions.